Veterinary acupuncture is no different than regular acupuncture. It is the insertion of small needles into the body to help with a condition. These needles are inserted into certain areas of the body in relation to their specific needs and treatment. The goal is to correct the imbalances of flow of the Qi and to restore health to the patient. These treatments for the animals can take between 1-60 minutes and usually take 3-5 acupuncture treatments before you notice a difference. Most of the time, the animals can move around while the needles are in. 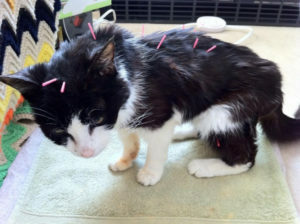 You must be a veterinarian to offer acupuncture to animals. While not necessary, it is recommended that you complete a training program to perform acupuncture on animals. What Kind of Animals Benefit from Acupuncture? All animals can benefit from acupuncture treatments. In the beginning, dogs, cattle, and horses were the first to receive acupuncture. Now, veterinary acupuncturists can treat cats, birds, rabbits, and wildlife with acupuncture. It is mostly used on dogs, cats, and horses though. Acupressure: This does not use needles at all. It still uses the same acu points, but instead of needles, the acupuncturist applies gentle pressure to the acu points. Aqua-acupuncture: Instead of the use of needles, a water solution, usually containing vitamins, is injected into the points where the needles would be inserted. Electro-acupuncture: This type of acupuncture involves the use of regular dry needling, inserting the needles into the skin. After needles are properly inserted, wires are attached to the needles and to an electrical stimulation unit. 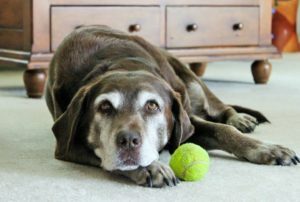 What Kind of Conditions Does Veterinary Acupuncture Treat? What is Acupuncture? FAQs. Animal Veterinary Center Bear, DE. Slatalla, M. 2008. Old Dog, New Trick: Acupuncture. The New York Times. Waggener, N. 2017. 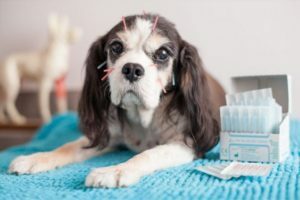 Acupuncture: Can It Help Your Pet? South Boston Animal Hospital. Feldman, J. 2005. 5 Health Benefits of Acupuncture for Dogs. PetCard RX. Can Your Pet Benefit from Acupuncture? Traditional Chinese Medicine World Foundation. 2015. Pet Acupuncture: The Benefits of a Healing Touch. Billings Animal Family Hospital.